The International Mediation Center (CIM) has announced that the Third International Congress on Mediation will take place on Thursday August 18 from 8:00 to 18:00 at the Salón Jade y Plata of the Hotel Camino Real. The Congress aims to provide effective methods for the solution of social and trade conflicts that affect the development of our society through dialogue. Mediation seeks to provoke changes that will benefit the people of Guatemala. “The aim of the Congress is to show firsthand the benefits of the method and how to put into practice the techniques in the social and business environment through dialogue. 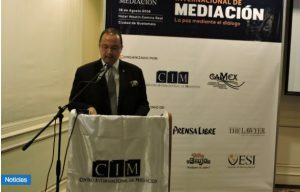 The intention is to achieve peace in the world “, stated Mario Bucaro, President of CIM. The activity will be attended by national and international speakers who will share their experiences, techniques and methods in order to promote the culture of peace around the world. The International Mediation Center is a private institution created and supported by CAMEX [The Chamber of Commerce and Industry of Guatemala/Mexico], made up of experts in the method of mediation to facilitate the resolution of disputes on a voluntary basis through dialogue and cooperation as the best way to resolve the differences between people and entities in the national and international private sector. Mediation began in the public sphere in 1998. Under the program of modernization of the judiciary, the President of the Judicial Agency created the Pilot Center of Mediation and Conciliation (21/998 and 22/998 agreements). Currently there are 78 public mediation centers in 14 departments led and managed by the judiciary. The one private center is the International Mediation Center. * The Phenomenon of Mediation and Its Trends. Mario Bucaro – Lawyer, Certified Mediator, President International Mediation Center Guatemala. * Alternative Dispute Resolution in International Trade. Judge Cristina Pareyra, lawyer, journalist Mediator and Legal Expert JAMS (Judicial Arbitration and Mediation Services) Miami USA. * Prevention and management of conflicts in Labor Relations. Wanda Azmitia – expert in mediation, Coordinator of the Unit of alternative dispute resolution Judicial Branch. * Juan Carlos Lucero-Lawyer, International Labor Mediator, an expert in social dialogue. * Community and Business Mediation as a response to restore social harmony. Laura Avila, Lawyer, Master in Business Law, Center for Arbitration and Mediation Center, Legal College, Costa Rica.